I spent some time thinking about pattern and design lines today, and the thoughtful comments that people offered on my last post (thanks! ).Â In particular, I was thinking about Janet’s suggestion not to disturb the vertical lines in the fabric.Â Princess seams would disturb the vertical line more than darts, and would also pose the difficult problem of matching stripes.Â I managed it in my brown silk-cashmere jacket but it took careful pattern placement, careful sewing, and considerable fudging at the end to make it work.Â It would be much less trouble, and less disruptive to the line of the coat, to shape it with waist darts of some sort. Along the same lines, flaring the garment would disrupt the natural fall of the stripe from top to bottom.Â I also didn’t particularly like the look in the muslin – it made me look way bigger because of the bulk of the fabric, and that was in muslin!Â So I think I’ve decided to eliminate the flare. So this left me looking for a darted, semi-fitted coat or jacket pattern.Â (A straight from the shoulder cut would make me look bulky – I know this from experience! – so I decided on a semi-fitted pattern. 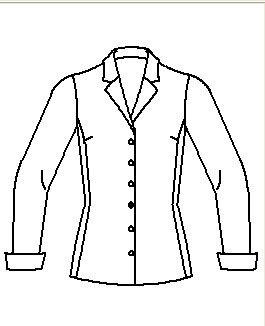 )Â I went through the websites of the four major patternmaking companies, only to discover that virtually all jackets/coat patterns had princess lines!Â I started wondering whether I was barking up the wrong tree, since virtually all patterns had princess seams. Then I had a burst of inspiration and looked in my closet.Â Sure enough, most of the jackets had princess lines…EXCEPT the ones with stripes!Â Those had darts.Â Darts and stripes went together well.Â I was on the right track. Of course, this left me with no patterns.Â I whipped out my handy copy of Patternmaking for Fashion Design by Helen Joseph-Armstrong (a comprehensive reference if I ever saw one) and flipped through it.Â It was pretty clear but also fairly complicated, and I was not looking forward to the several hours it would take me to figure it out, then draft a pattern that might or might not fit. Then I remembered that I had shelled out $200 awhile back for some pretty cool pattern drafting software: Celebrations 3 from Wild Ginger.Â Basically you enter in a bunch of measurements and then select from a broad range of styles available (body, collar, sleeves, etc. ).Â It generates a pattern which is designed to your measurements and could therefore be used with no alterations. This is a panel cut, meaning there’s three panels on each side: a front, a back, and a side/underarm panel.Â I liked the look of this – it maximizes the width of the front panel, and only has one small horizontal dart to interrupt the line.Â I think it will work well. Wow – that’s cool that software can do that!! Your whole project and process amaze and inspire me!!! Great software. The lines of this jacket are very flattering. You’re on the right track, I think this will be lovely. This should work well. Great lines! Software is wonderful when it works. I was surprised that you did not use any kind of pattern making software. I have been following your doings and let you go ahead. I want to weave fabric for at least a jacket but only when you are done I will begin to think about it. Let the brave lead the way! You might already follow Daryl Lancaster’s blog, but she’s doing some jacket design using Photoshop in this post that I thought you might find interesting. You’re doing a great job on this project! So amazing! !